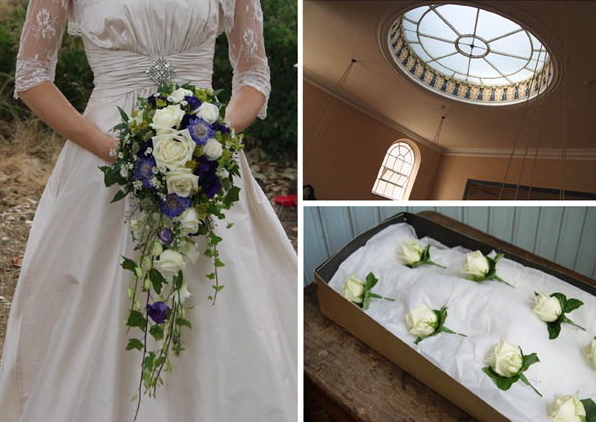 As a florist it's not often that you get the opportunity to work with a bride who pretty much gives you a free rein with the flowers, so when Georgina contacted me and asked me to design her wedding flowers I jumped at the chance. 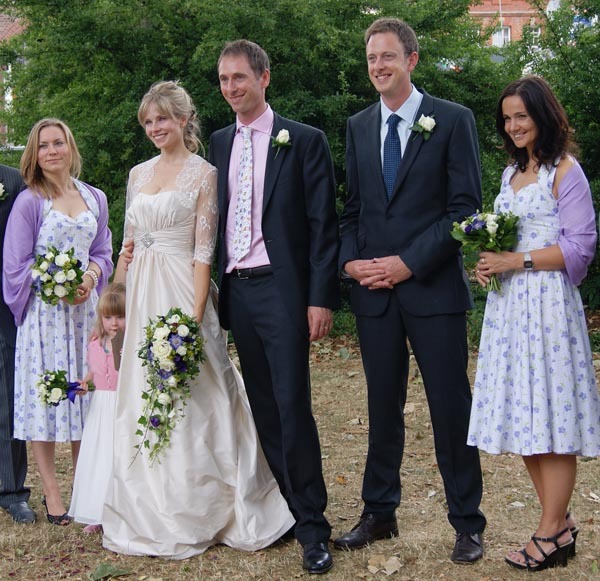 Georgina is so gorgeous that she was always going to make a really beautiful bride but she looked absolutely breathtaking in her stunning Paloma Blanca dress. 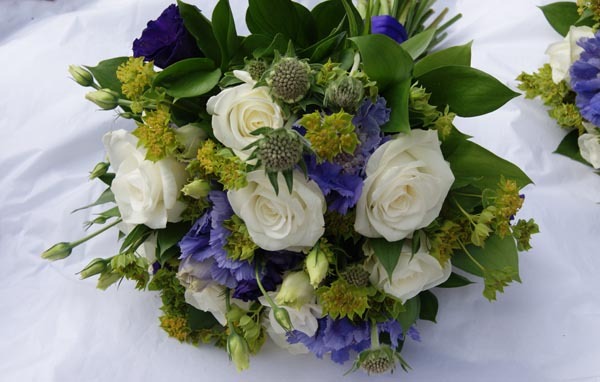 The bouquet I made for her included Akito roses, Dendrobium orchids, Lisianthus and Scabious. 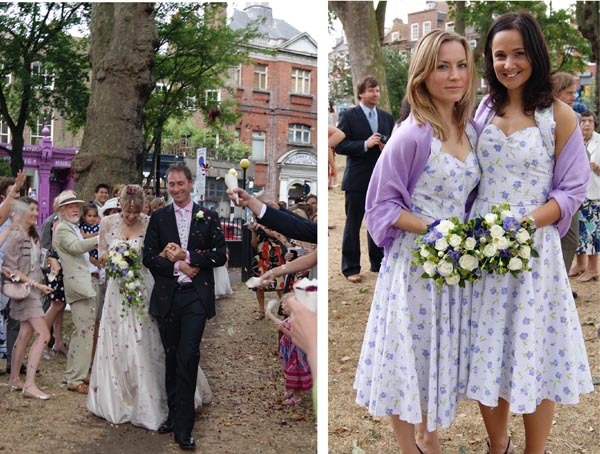 The bridesmaids carried matching hand-tied posies and wore the cutest 50s style print dresses by Vivien of Holloway. How pretty do they look? 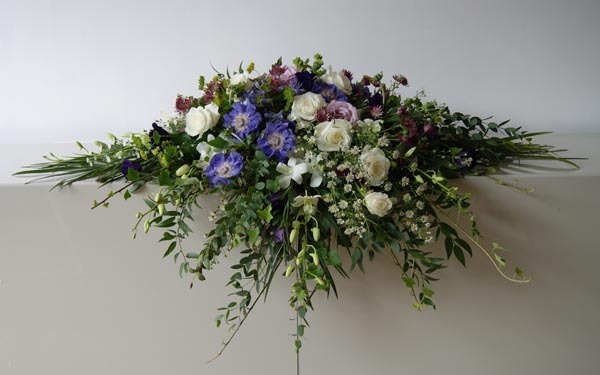 During our consultations Georgina told me that they wanted an informal, creative and fun celebration.- something that they managed to achieve in spades. It's not every day you attend a wedding where the groom and his band perform an Elvis rendition during the ceremony. Their ceremonial blessing was held at the Unitarian Church in Stoke Newington on a lovely sunny day earlier this month. In 2008 the church suspended full marriage services until all couples, gay and straight, have equal marriage rights and the church has a really fascinating history. It's former congregants inclue Mary Wollstonecraft who worshipped there in the eighteenth century. Afterwards an informal reception was held at the local working man's club, complete with super kitsch original 1950s retro interior and some really cool hand crafted details including a Rob Ryan inspired table plan and the prettiest paper cut outs. It really was an honour to be a small part of this very lovely day. Huge congratulations and best wishes to John and Georgina.